Jonathan Fryer on Robert Lacey's talk at Caabu "Inside the Kingdom"
When Robert Lacey first had the idea of writing a book about the Saudi royal family — following his successful examination of Britain’s House of Windsor — Saudi Arabia was a far off country off whom most Brits knew nothing (unless they worked in the oil industry, or encountered high-spending Saudis in London). The author lived in the Kingdom (which would become the title of his equally successful resultant book) in the mid-1970s, when it was still possible to see Saudi women water-skiing in bathing costumes, as he rather startlingly informed a large audience gathered in the House of Commons in London this evening, at an event organised by CAABU (the Council for Arab-British Understanding). 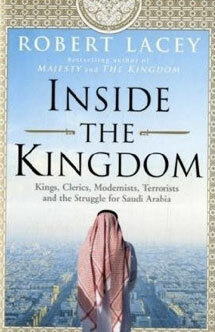 Returning to the desert more than three decades later — to research his follow-up volume, Inside the Kingdom (Hutchinson, 2009) — he found a nation that had become much more conservative in many ways, though the current monarch, King Abdullah, is gently instituting reforms, despite opposition by hardline clerics. Lacey entertained his audience tonight by his descriptions of how the Saudi royal family works, illustrating his words with some interesting photos and charts, but he disappointed those who were hoping that he might suggest that the Kingdom’s rulers could be next in line to be swept aside by the wave of popular unrest sweeping North Africa and the Middle East. Nonetheless, there are good reasons why many Saudi citizens should be disgruntled, including high unemployment and a degree of poverty among some nationals that is shocking by Gulf standards, especially when contrasted with the obscene wealth (my words, not his) of many of the thousands of princes who do very well from their connections.